Already a member? Log In above to be taken directly to your membership page. Are you ready to Ascend to a new level? * These aspects of the membership apply to the first 12 months. After that, you may continue the membership to receive access to the monthly Zoom calls with Maureen. You will need to include your credit card information at check out, but you will not be charged for the first month. After the first month you will be charged only $11 per month. You may cancel at any time. The membership will show up on your statement as Transformational Enterprises, Inc.
And yes – you saw that right. Every month, both monthly and yearly memberships include one of Maureen’s meditation downloads. 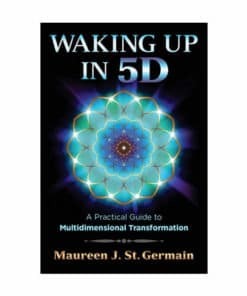 Lessons are based on Maureen St. Germain’s best-selling book Waking Up in 5D, and each monthly lesson will follow the chapters in the book. While reading the corresponding chapter will provide a broader knowledge base, purchasing the book is in no way required. You will still get a great deal out of each lesson. Haven’t read Waking Up in 5D yet? Get it Here! Answer the call – the 5D Wake Up Call! and join a community of like-minded individuals! I want you to know that I have benefited greatly from what you have to offer, and I thank you so much for everything you do in order to help people grow spiritually, thereby raising awareness and collective consciousness which is so important at this particular time. Thank you Maureen and much Love to you and all.